Instead of expanding a broken Medicaid system, Michigan’s Governor Rick Snyder, who touts achieving best value for money, should be favoring a true healthcare fix. One that provides better service and quality at a lower cost to all Michigan citizens. A true fix would emphasize primary care, which is not only the part of our healthcare system that we all interact with the most, but also the part that is most likely to positively affect our health. Fortunately, such a fix exists with Sen. Patrick Colbeck’s Patent Centered Care Act (PCCA). 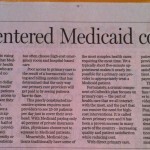 The PCCA is a better way to reform Medicaid and a giant opportunity to reinvent this great state. It is impossible to reinvent Michigan if our state’s second largest expense, Medicaid, is not positively reformed. In addition to the ever-rising cost, research shows that being on Medicaid provides no better health outcomes than not having coverage at all. This means that one-third of our state budget is largely wasted. Medicaid patients have a very difficult time getting an appointment with a primary care provider because nearly one-half of Michigan’s already small number of primary care providers do not accept Medicaid. Therefore, either based on necessity or convenience, Medicaid patients use high-cost ER and hospital-based care at disproportionate rates. Poor access to primary care is the result of a bureaucratic coding and billing system that has determined that the only way our primary care providers will get paid is by seeing patients face-to-face. The more patients a primary care provider sees in a day, the more money they make. Most providers need to see 25-40 patients per day just to cover their overhead, and, with Medicaid paying only 40% of private insurance rates, not accepting Medicaid becomes an easy decision for overworked providers. Medicaid patients have some of the most complex health cases requiring the most time. Yet, it is impossible for a primary care provider to appropriately treat a Medicaid patient with chronic disease when limited to a 5 minute appointment. Our system is failing those that need the most help! We have to start from scratch and build a new system. We are in luck, reinvention is fairly easy since a proven invention already exists in many parts of America, including our own state of Michigan, and is a crucial part of Sen. Colbeck’s PCCA. It is called Direct Primary Care and strong evidence demonstrates that this model of care increases quality and patient satisfaction while reducing cost. With Direct Primary Care, patients pay their primary care provider directly, usually on a monthly basis. If the provider does not provide good quality and service, the patient simply takes her direct payment elsewhere. This payment arrangement removes the need for a face-to-face visit in order for the provider to be paid, allowing the provider to treat many non-urgent issues over the phone or online. Plus, it eliminates the time-consuming billing and coding paperwork, freeing provider time to be spent on the most complex conditions. Now, instead of providers expecting patients to wait forever for short 5 minute appointments, providers are pushed to provide better service to patients. 24/7 provider access, no-wait appointments, and most importantly, the opportunity for patients to develop a strong relationship with a provider become the norm with such practices. Michigan is fortunate to have excellent hospital systems. However, care in these facilities is the most expensive part of our medical system. Shouldn’t we be trying to avoid those high-cost procedures in the first place through the use of high-performing primary care? Since good quality primary care is a threat to our hospitals’ revenue, many of our respected hospital executives would prefer to simply expand the current Medicaid system. They make their case under the guise of limiting hospital care that goes unpaid by the uninsured (i.e. uncompensated care), but if we treat health issues at the primary care level, we greatly reduce uncompensated care. Michigan’s most prominent insurance carriers are also pushing for the status quo. They believe they have already addressed the need for high performing primary care with their Patient Centered Medical Home concept (PCMH). But, all of their work is simply a continuation of our corrupted coding-based system. Giving bonuses to physicians for extra technology and care coordination is nice idea, but PCMH is nothing more than a Band-Aid reform that has been compared to putting wings on cars and calling them airplanes. You might ask, “How many of our current primary care providers will convert to the Direct Primary Care model if the PCCA is implemented?” But the focus should not be on converting. Instead, it is about creating a whole new industry in Michigan. When Henry Ford made the car prominent, did people worry about how many existing buggy manufacturers would convert to building cars? Direct Primary Care develops a new industry and market based on common sense and efficiency. Conquering our healthcare cost problem is one of the great challenges of our time. We are paying for it, it is time we demand more! Sen. Colbeck’s Patient Centered Care Act finally fixes the problem in ways in which no other state or federal government plan has come close. If we open up our market and free our primary care providers to create new ways of delivering care, providers, entrepreneurs, and companies will flock to our state to develop new tools to better treat patients. We will, using the Governor’s words, reinvent Michigan, and make Michigan a leader and model for the rest of the country. Tom Valenti is President and COO of BlueSky Health, a health system design and patient care company in Michigan.